In yet another historic feat for the state of Arunachal in the field of Film and entertainment, ’AABA’ , a short film by Amar Kaushik, a famed director in Bollywood, Mumbai and co-produced by Alison Welly under Space Miracle Studios, Itanagar, has officially been selected for the ‘Generation Competition Category’ at the internationally acclaimed 67th Berlin International Film Festival . Founded in the year 1951, the Berlin International Film Festival, also called Berninale, is one of the world’s leading film festivals and most reputable media event. It is held annually in Berlin, Germany. 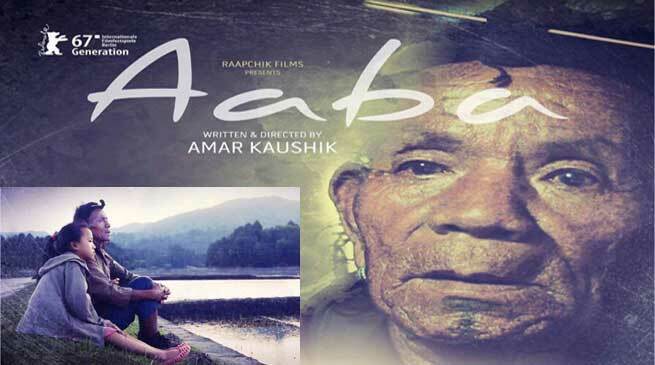 It is pertinent to mention here that the short film, AABA was shot entirely in Ziro. Entire team of cast was from Ziro with Dani Randa as Aaba, Dani Chunya, Dani Suku, Hage Yami & Dr Joram Khopey. The film is in the Apatani dialect, making it all the more worthwhile to celebrate this rare feat of an international recognition for the state. The film has been written and directed by Amar Kaushik, a long term associate of the National Award winning Director Onir, and he was also the assistant director of the blockbuster film ‘No One Killed Jessica’ starring Rani Mukherjee. Alison Welly an emerging producer is here again with her unique film ideas, after one of the most popular feature film of the state, ‘Itanagar 0 KM’ under Space Miracle Studios, which she also serves as the Chief Managing Director. Raj Kumar Gupta and Onir, two ace film makers known for content-driven cinema, along with film enthusiast Mitul Dikshit also decided to produce this masterpiece. Hali Welly, another film enthusiast & a known photographer from the state is the line producer of this short film. It is also worth mentioning here that ‘AABA’ is the only official selection from India at the 67th Berlin International Film Festival. The film will be premiered in the Generation Kplus competition on February 11, 2017.